Call us for booking and information, or for a free quote. The Removable Gooseneck (RGN) trailer has a detachable front end that turns the trailer into a ramp. Past the detachable section of the trailer, RGNs are equipped with a double drop formation that lends the payload an extra amount of height, usually around 12 extra inches. The variable nature of the RGN trailer allows it to accommodate cargo that is more difficult for less flexible trailers. Referred to as a "detach", the RGN is ideal for transporting less than standard cargo, equipment that is longer, taller, or otherwise a non-normal size. Tractor Transport typically uses standard RGNs when the cargo can be driven up the ramp and secured on the trailer by our team of logistics specialists, or it can be safely loaded by crane. 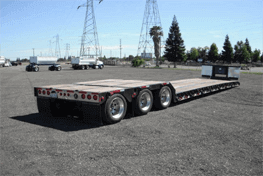 WHAT IS AN RGN TRAILER USED FOR? 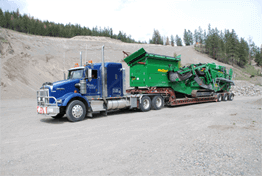 RGNs are ideal for shipping construction and farming equipment that are tall, long, and heavy. This flexible cargo capacity comes in handy when dealing with excessively large tractors, farming combines, and other very large equipment. 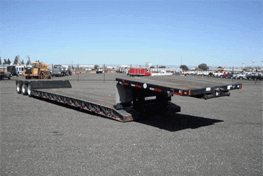 The most attractive feature of the Removable Gooseneck Trailer is that it can be configured in a variety of arrangements and axle numbers to meet the customer's shipping needs. Whether you have an especially heavy tractor, construction equipment, or farming equipment, the RGN can adapt to handle your cargo. Tractor Transport even uses cranes to load RGNs in some cases. Similar to the standard Removable Gooseneck Trailer, the stretch RGN has an added section for additional length and capacity for particularly tricky transport jobs. When cargo is too long for the standard Removable Gooseneck (RGN), we sometimes employ the stretch RGN. Like the standard RGN, the back portion of the stretch RGN is removable, creating a convenient ramp. The stretch RGN has a versatile extension feature that allows it to meet an increased number of length requirements for cargo. What Are the Stretch RGNs Used For? Like their name suggests, stretch RGNs are for tractors and equipment that need an even more accommodating cargo holder. In many cases, a standard RGN gets the job done when the convenient removable drop feature needs to be utilized. When the cargo in question is especially long, however, the stretch RGN has to be employed to fit the specifications of the tractor or equipment in focus. 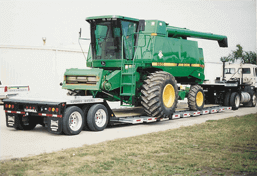 How Does Tractor Transport Handle Strech RGN Shipping? Typically, the stretch RGN is more flexible than the standard RGN, so it's only used when absolutely necessary. If you're not sure which option works most adequately for your cargo, feel free to contact our expert customer support team for all the answers and logistics solutions you could ever need regarding your tractor. Tractor Transport can provide much needed information on the best shipping routes and methods to ship your valuable equipment. We also offer unmatched security during the journey, and customer conveniences, such as free cancellations and fixed rates. To find out how to get Tractor Transport working for you today, call our offices and schedule a free consultation at (877) 373-0109.